The McAden stands out as being different from many of the other large houses in Myers Park. Located at 920 Granville Road, it was built by textile man and banker Henry M. McAden in 1917-1918, and was designed by Charlotte architect Louis Asbury. The modified Roman and English country house with Roman Doriccolumns still retains a great deal of its original style, character, and detail. During the first week in June, 1917, work began on the McAden’s new house, and it was probably late 1917 or early 1918 when it was ready for occupancy,9 but it took until 1920 before every last detail was completed, which included landscaping according to a design by E. S. Draper.10 The total cost of destruction is reported to have been over $150,000. The McAdens were very active in civic and social affairs, and the home became one of the city’s centers of hospitality. Unfortunately for the McAdens, the Great Depression brought devastation in its wake. On December 4, 1930, the First National Bank was in default, and had to close permanently.12 In 1935, the McAdens Mills also shut down because of a jurisdictional dispute between rival unions, and they did not open again until they were sold to the Stowe Mills of Belmont in 1939.13 In 1940, unpaid back taxes forced the sale of the Myers Park house, which was bought at auction by William Henry Belk of the Belk Brothers Department Store for $11,230.00. 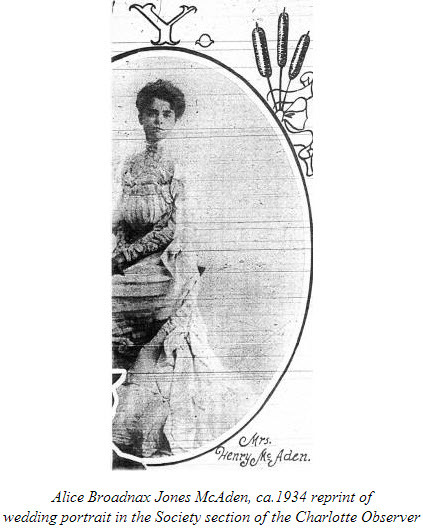 Belk conveyed the property back to Mrs. McAden, who in turn immediately reconveyed it to George M. Ivey, owner of Ivey’s Department Store, doubtless according to a prearranged agreement.14 Following the demise of his bank, Mr. McAden semi-retired, but he and Mrs. McAden continued to live in their Granville home until about 1942, when they moved to Cherokee Street in Eastover. The McAden House is one of the unique features of Myers Park, which in itself has national historic importance, and its distinction as a Louis Asbury design with Earle Draper landscaping as well as its association with some of the city’s leading citizens make it fully worthy of historic designation. The H. M. McAden House is one of the finest architectural speicmens in Myers Park, Charlotte’s premier streetcar suburb. Designed by MIT-trained Charlotte architect Louis Asbury and built about 1917 by contractor J. A. Gardner, the two-story dwelling commands a tre-shaded site located on curving Granville Road near the center of the neighborhood. Scorning the earlier excesses of Victorian architecture, Asbury gave the house a clean rectilinearity influenced by English and Italian country-house design. Its smooth stucco exterior is embellished only with understated Roman Doric columned porches. The spacious interior features handsome mantels, a panelled library and a grand horseshoe stair. Louis Asbury used an open, flowing plan and abudnat windows to connect the interior with the grassy front lawn and rear Italian garden created by noted planner Earle Sumner Draper. The landscape design was a major one in Draper’s career, and was featured in the magazine Southern Architect in 1924. The residence and grounds have seen no major changes in their seventy-year existence. In massing, the McAden House is a rectangular block with its long side facing the street and with a smaller rectangular service wing projecting from the rear. The hip roofs are covered in green tile. Under the wide overhanging eaves the rafter ends are left exposed and cut in subtlely scalloped shapes for ornamental effect. Heavy square downspouts of copper or brass catch rainwater from the gutters and direct it towards the ground. The front elevation is symmetrical, framed by massive stucco interior end chimneys. The second story has five window openings with double-hung six-over-one-panesash and slender decorative shutters. At the center of the first story is a shallow one-story portico that shelters the entrance. The portico features two pairs of RomanDoric columns supportico a heavy cornice, all executed in masonry. The entry itself consists of “French” double doors, each with twelve square panes of glass, flanked by full-length sidelights and topped by a fan-light transom. On either side of the portico is a trio of French doors, highlighted by a label molding above the lintel. These doors, which open onto the front terrace, were designed to allow parties held inside in the dining room and living room to spill outdoors. The red-brick terrace extends the full width of the front facade. An important part of Asbury’s design, as seen from the street, are the matching side porches. These heavy one-story flat-roofed structures echo the front portico with stuccoed Doric columns and chunky cornices. Between the columns, all is glass, divided into small-paned windows and doors and fan-light transoms just like the main entrance. The side and rear elevations of the house incorporate the same elements as the front, but with less concern for symmetry. Windows are double-hung units with single-pane lower sash and either four or six panes in the upper sash. There are no decorative shutters, but the elaborate downspouts seen at the front are used here as well. French doors open from the library and from the south side porch onto a back terrace much like the front one. The projecting rear service wing is two stories tall and has a one-story extension (part of the original design) at its rear. Inside the McAden house, architect Asbury was somewhat less restrained in his use of historical embellishment. The floorplan itself is simple and elegant. Much of the first floor is devoted to areas for entertaining. A grand hall forms the core of the plan. To the left of it, through a wide archway (with sliding pocket doors, believed to be mahogany) in the large living room. To the right, through a similar opening, is the equally large dining room. Somewhat hidden, to the rear of the living room, is the library. To the rear of the dining room are the pantries and kitchen. The focal point of the house is the grand stair which ascends dramatically from the rear of the hall. It rises three steps to a landing, then splits in two, forming a horseshoe rising to the second floor landing. Bedrooms, all interconnected, radiate from the landing. The living room features panelled wainscoting and elaborate cornices with egg-and-dart molding. The original electric “candle” sconces still grace the walls. The south end of the room is dominated by an Adam style mantel executed in cream and sienna marble and carved with a relief of seven children at play. French doors which flank this fireplace lead to the south side porch, called the solarium. The solarium ceiling has two light fixtures of milk-glass and brass. One wall of the solarium is a huge fireplace with a heavy Neoclassical mantel said to be of carved granite (now painted white). The dining room also has an egg-and-dart cornice and panelled wainscoting, but it also features molding applied to the upper walls in rectangular shapes. Sconces here are said to be brushed steel. The present crystal chandelier replaces a smaller original fixture. There is a second creme and sienna marble Adam style mantel, of somewhat different design. French doors flank this fireplace and open onto the north side porch, the breakfast porch. It is nearly identical to the solarium in its granite mantel and abundant windows. Only the hanging light fixtures are different, variations on the milk-glass and brass theme. The library is panelled floor to ceiling in a dark wood believed to be mahogany. Built-in bookcases, perhaps five feet high with leaded glass doors, line three walls. At the north side of the library a door leads to a small hall, which holds closets, a telephone room (relic of the early years when only the wealthy had phones, and even they had only one in the house), and a bathroom. The bathroom is finished in the same manner that all the dwellings bathrooms are. Tile wainscoting extends some seven feet up the walls to a line of molding. Similar molding frames and oval mirror over the pedestal sink. The toilet here (and those in most other bathrooms throughout the house) is of comparatively recent vintage. The service areas behind the dining room begin with an extremely large butler’s pantry. Low cupboards topped by counters (updated with formica) line the walls. Above the counters are glass-fronted china cabinets. Near the center of the floor is a radiator-like cast-iron warming table, a common feature in expensive houses of that day. A hallway runs from the rear of the butlers pantry — past a food-storage pantry and a walk-in refrigerator room — to the kitchen. This space has been almost completely renovated over the years, and a wall has been knocked out to turn an enclosed north porch into a breakfast nook. But the kitchen still has the original servants’ call-box on one wall. On command from elsewhere in the house, numbers flipped down behind the glass to let servants known where they were requested. Behind the kitchen is an enclosed rear entrance and a large laundry room. One can return to the grand hall by means of a back hall leading from the kitchen. This space includes the servants’ stair to the second floor, and also a high-ceilinged drapery closet which still has its hooks for hanging unneeded curtains. The grand hall has a dentilled cornice, sconces, and panelled wainscoting. Umbrella closets flank the front door. The wells were at one time lined from wainscot to ceiling with wallpaper painted in European landscape scenes. Today only two sections of this survive, now set off with frames of molding. The horseshoe stair at the rear of the hall appears to follow Adam style precedents. Slender turned balusters support the with balustrades. A tall rear window lights the stairwell, and walls are completely panelled in wood. Upstairs, opening directly onto the landing, is a small front sitting room. Around the landing are the doors to the bedrooms. Three bathrooms link the bedrooms, and there are also a pair of rear “sleeping porches.” These many-windowed rooms were a favorite of health-minded Americans in the 1910s. At the north rear corner of the second floor, at the top of the servants’ stair, is a small corridor with doors to a walk-in linen closet and a separate ironing room which once had its own Paul Bunyanesque built-in ironing board. The master bedroom is at the south front corner of the second floor. It has a delicate carved wooden mantel, a clothes closet with built-in drawers and a light (apparently original) that goes on when the door opens, and on the wall next to the bed the original push-button electric light switch plus an elaborate system of call buttons for servants. The adjoining bathroom has the tile and fixtures already described downstairs, plus a tub and shower designed for all-body spray. An interesting feature is the provision of two sinks and two oval mirrors for the convenience of the lord and lady of the house. The other bathrooms and bedrooms are similar (including lighted closets with built-ins) but smaller. In the north front bedroom is a notable milk-glass and brass ceiling fixture taken from a downstairs room and said to hwe been designed by Tiffany Studios. The house has a large attic with plastered walls and abundant natural light. The plaster has deteriorated in recent years and has fallen away from the wooden lath. One section of the attic is a walk-in cedar closet, still sweet with the aroma of the wood. There is also a basement under the house. Under the main house it is excavated to nearly full height, and is filled with brick structural piers with florins of the living red clay. Under the service wing the basement is more fully excavated and fully finished with brick walls and concrete floors. Segmental arched doorways here lead to a workroom and to the furnace room, where there is a new furnace. Asbury designed the house with a built-in “central vacume” system, a popular house-cleaning tool among the well-to-do of that time. Piping throughout the house leads to a unit which still stands in one corner of the furnace room. Also extant under the service wing is the mechanism for the mechanical sprinkler system, a fire-prevention feature that presumably is still hidden throughout the residence. 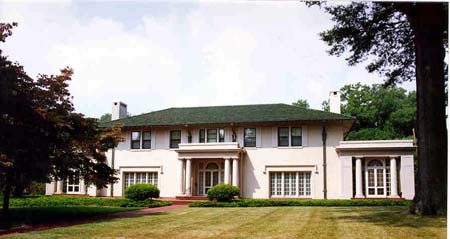 Earle Sumner Draper’s grounds for the McAden house featured a tree-shaded front lawn with a brick drive running straight up one side to a circle in front of the detached rear garage. The brickwork here and throughout the grounds is (remarkably) in as good condition as the day it was laid, thanks to a concrete subbase. The garage, presumably by Louis Asbury, has stuccoed walls and a tile hip roof just like the main house. The original garage doors have given way to an overhead door. On either side of the automobile space is a servants’ apartment. Some interior changes have been made in the north apartment but the south apartment remains in original condition with two bedrooms, a bathroom, a kitchen, and a sitting room. The design featured strict geometry defined by brick walkways. Draper divided the garden into two spaces. A patio-like area, which nestled within the “L ” formed by the rear wall is of the house, featured square walks and flowerbeds and had a large curved seat of carved marble at one edge. Adjacent was the second space, which featured a round walkway and a central fountain. Draper remembers that there were even native cedar trees trimmed to represent Italian cypress. Today most of Mr. Draper and Mrs. McAden’s plants are gone, but the beds still hold their shape, the brick walkways survive in mint condition, and the marble seat remains a focal point. 1 Robert A. Ragan, The Pioneer Cotton Mills of Gaston County, NC and Gaston County Textile Pioneers (Charlotte: n.p., n.d.); Samuel A. Ashe,Biographical History of North Carolina V, 198-202. 2 Charlotte Observer June 23, 1957, p. 2D; LeGette Blythe and Charles Brockman, Hornet’s Nest (Charlotte: Charlotte Mecklenburg Public Library, 1961), p. 304. 3 Charlotte Observer June 23, 1957, p. 2D. 4 Charlotte City Directories 1902-1918. 5 Mary Norton Kratt and Thomas W. Hanchett, Legacy: The Myers Park Story (Charlotte: Myers Park Foundation, 1986), pp. 16ff; William H. Huffman, “A Historical Sketch of Queens College,” Charlotte Mecklenubrg Historic Properties Commission , 1984. 6 Legacy, cited above; William H. Huffman, “A Historical Sketch of the Draper House,” Charlotte Mecklenburg Historic Properties Commission, 1983. 7 Architectural Job List, #229, Southern Historical Collection, University of North Carolina at Chapel Hill. 8 Information on file at Charlotte Mecklenburg Historic Properties Commission. 9 Charlotte Observer, June 10, 1917, p.14. 10 Interview with Ona McConnell, Charlotte, NC, November 21, 1986 with Louis Asbury on visit with McConnells, October 1966. 11 Conversation with Louis Asbury, Jr. and Thomas R. Neukom. 12 Charlotte Observer December 5, 1930, p. 1. 14 Mecklenburg County Deed Books 1026, p. 545; 1029, pp. 167, 168. 15 Mecklenburg County Deed Books 1341, p. 431; 2212, p. 13; 2759, p. 302. 16 Who’s Who in America, 1985 edition. 1. 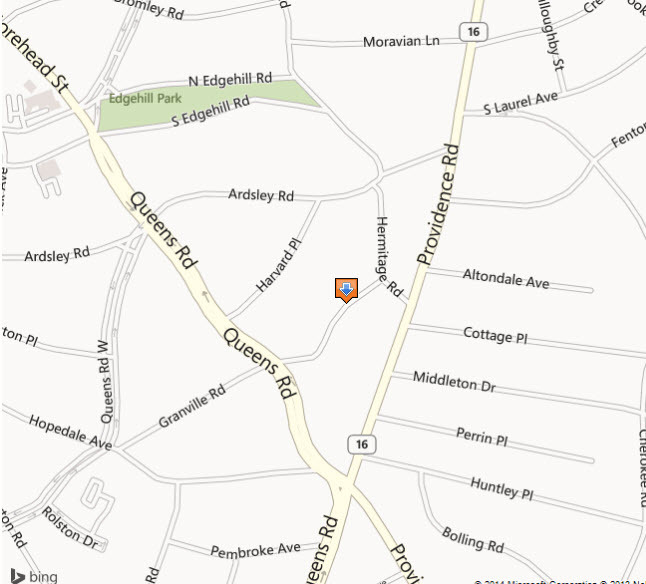 Name and location of the property: The property known as the Henry M. McAden House is located at 920 Granville Road, Charlotte, North Carolina. 5. Current Deed Book Reference to the property: The most recent deed to this property is recorded in Mecklenburg County Deed Book 2759, page 302. The Tax Parcel Number of the property is: 155-053-06. 6. A brief historical sketch of the property: This report contains a brief historical sketch of the property prepared by Dr. William H. Huffman. 7. A brief architectural description of the property: This report contains a brief architectural description of the property prepared by Thomas W. Hanchett.